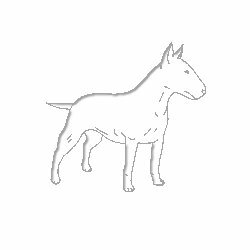 Bull-Terrier.co.uk, a web page for bull terrier enthusiasts,forum for new owners,mailing list, bullie books and merchandise. The UK's best bullie page! A MUST FOR EVERY BULLIE OWNER!! If you would like a tribute to your bullie at the Bridge please contact me. We are Ann and Michelle, we live on the Lincolnshire coast in the UK. After wanting a bull terrier for many years our dream came true a couple of years ago when we became the proud owners of Maisie!! She is now 5years old and is still the most cute little rascal I have seen!! We also have her nephew, Harry who is almost 3 years old. 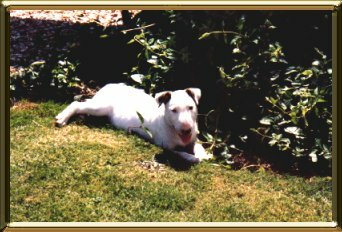 Since having her we have learned a lot about looking after bullie pups and hope to find the time to put all we have learned on the web site to help out other new owners. When you have finished looking around please sign our guestbook so that we know that you have visited. Thank you! The only mailing list where it is the bullies that do the writing! !